On Oct 21, 2016, FIFA has chosen the Official Mascot for World Cup 2018 Russia. The Mascot has been named Zabivaka a Wolf which means the one who scores. The Mascot Wolf has been represented with brown and white wool T-shirt which has named Russia 2018 on it. The color of Mascot has been selected from Russian National Football Team dress. The White, Red, Blue and Orange is their national team dress color. 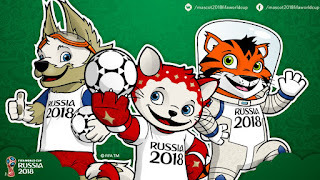 On Sep 2016, a campaign has been started to decide who will become the Official Mascot of FIFA World 2018 Russia out 3 characters Cat, Wolf, & Tiger. This trio has been highlighted at annual Circle of Light Moscow International Festival at the iconic Moscow State University. The decision for who will be the Mascot for 2018 World Cup is taken by Russian Fans by Online voting and that was unveiled on 21 Oct 2016. 51,000 Russian fans take part in this only survey to decide the Mascot for 2018 World Cup. A Russian Student named Ekaterina Bocharova has designed the Wolf character. On 22nd Oct, 2016, The result of online voting has been published with 53% Votes went to Wolf (Zabivaka) then Tiger 27% and Cat 20%. More than 1 million votes has been count for this decision. 1966 World Cup Willie A lion, a typical symbol of the United Kingdom. 1970 Juanito A boy wearing Mexico's kit and a sombrero. 1974 Tip and Tap Two boys wearing Germany kits, with the letters WM. 1978 Gauchito A boy wearing Argentina's kit. 1982 Naranjito An orange, a typical fruit in Spain, wearing the kit of the host's national team. 1986 Pique A jalapeño pepper, characteristic of Mexican cuisine, with a mustache and wearing a sombrero. 1990 Ciao A stick figure player with a football head and an Italian tri-color body. the World Cup Pup A dog, a common US pet animal, wearing a red, white and blue soccer uniform with the words "USA 94". 2002 Ato, Kaz and Nik (The Spheriks) Orange, purple and blue (respectively) futuristic, computer-generated creatures. 2018 Zabivaka A wolf with a name translating from Russian like The Goalscorer.